All data is from Dept. of Defense strike reports (link). Throughout 2014 and much of 2015, the Islamic State’s national oil company was professionally-run, production stood at 50-80 thousand b/d, and oil revenues added up to $40-50 million a month, if not more, according to ISIS records. By most estimates, oil was probably the single greatest contributor to ISIS coffers. It took three years to destroy the ISIS oil network and oust the group from oil-rich territory in Syria. But in the end, the U.S.-led coalition proved up to the task. ISIS is no longer the “richest terrorist group in the world.” Its oil fortunes have disappeared, along with its territorial control. ISIS is no longer the “richest terrorist group in the world.” Its oil fortunes have disappeared, along with its territorial control. The first “surgical” strikes to target ISIS oil infrastructure were launched by the U.S. in September 2014. For that first year, dozens of strikes targeted refineries and oil stockpiles. 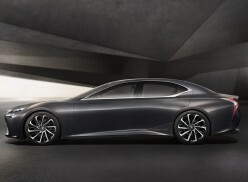 Caution ruled the day, however, as the U.S. was confident that the first wave of strikes had impaired the oil trade. 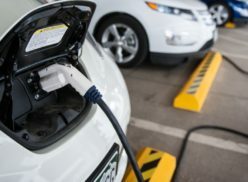 There were also lingering concerns at the time about whether expanding the target list might risk an environmental catastrophe. Moreover, strikes got off to a slow start because other tactical and strategic priorities ranked higher, such as lifting the ISIS siege of Kobani, in Syria, and breaking the group’s momentum in Iraq. In May 2015, U.S. commandos crossed the Syrian border in the dead of night to capture the head of ISIS oil operations. Abu Sayyaf was killed during the attack on the Omar oil field complex, but his personal records, memos, and correspondence provided the Coalition with new insight. Armed with that insider knowledge and recognizing that the trade was much more resilient than previously thought, the U.S. wisely changed its approach and began a much more aggressive campaign to attack ISIS oil. Operation Tidal Wave II was launched in October 2015 to destroy the ISIS oil empire with more strikes on many more kinds of targets. Thereafter, the Coalition started hitting not just refineries and oil in storage but also wellheads on the surface and the trucks that delivered oil to small-scale local refiners. 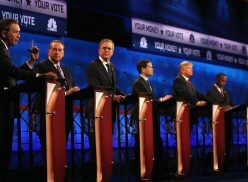 Tidal Wave II gained momentum throughout President Obama’s last year in office. Over 600 oil assets were hit in 2016, about half of which were oil wells in eastern Syria, where production was concentrated (900 trucks were also hit). The big question facing the new administration in 2017 was whether or not to double down on a winning strategy. President Trump promised to do exactly that—and he did not disappoint. 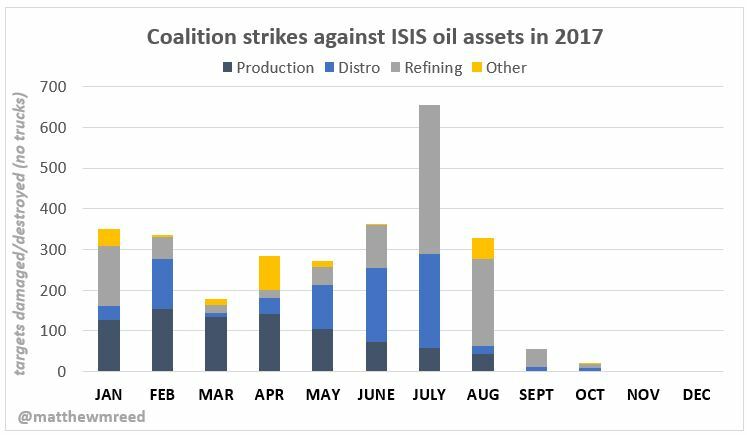 From his first day in office through the first half of 2017, the Coalition reported more than 1,500 strikes against ISIS oil targets (plus 358 trucks). Given the relentlessness of the barrage, it’s hard to imagine ISIS producing much oil at all by mid-summer last year. 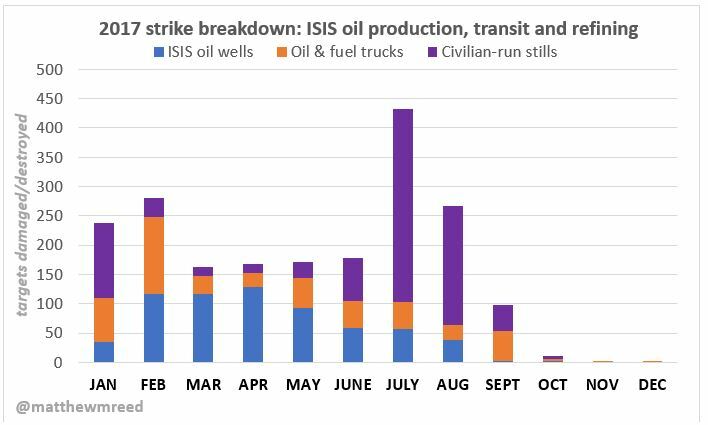 Measured in strikes, my last update pointed to June 2017 as the single worst month for ISIS oil: 363 oil targets were damaged or destroyed that month. But that trend continued into summer, and July 2017 was even worse for ISIS. 655 oil assets were hit that month. Given the relentlessness of the barrage, it’s hard to imagine ISIS producing much oil at all by mid-summer last year, and my official sources told me at the time that ten thousand b/d was too high of an estimate for ISIS production. Not long after that, the situation on the ground started to change, and oil strikes fell dramatically. Tidal Wave II effectively ended in September 2017. Whereas over 300 oil strikes were reported in August, there were only 55 in September, almost all of which were in the first week. Why the sudden drop? The reason is simple: Strikes stopped because ISIS territory was shrinking rapidly. Nothing was off-limits in 2017. 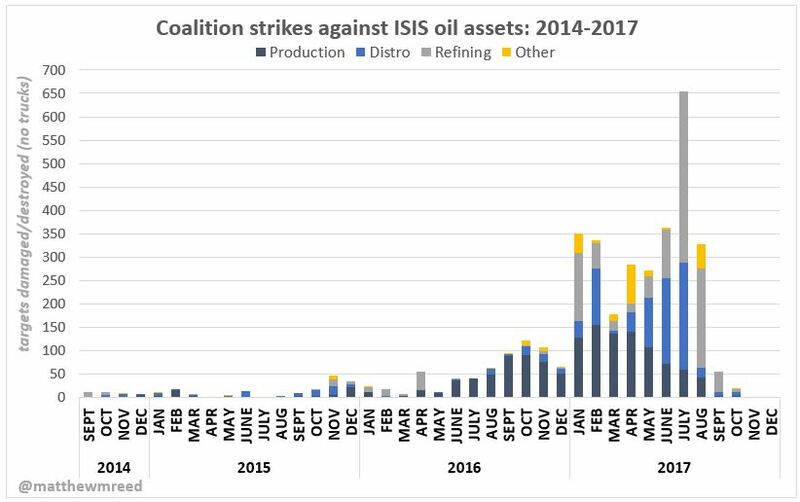 The Coalition attacked the oil trade at every point no matter who was in possession of the oil at the time: Both ISIS and civilian-operated targets came under constant attack through the first nine months of the year. Where oil reached the surface and ISIS maintained control, strikes hit oil wells and casings below ground. Almost 500 oil and fuel trucks were taken out last year; most if not all of those were operated by civilians. And, for the first time, the U.S. started systematically hitting civilian-run oil stills last year. Combined, thousands of those stills represented the vast majority of refining capacity inside ISIS territory. All told, the U.S. hit 872 stills last year (329 in July alone). Surprisingly, the U.S. also found and destroyed a total of 18 modular or semi-sophisticated refineries in 2017. ISIS must have managed to salvage, disguise or repair these over the years. There’s been very little action so far in 2018. Through March 23, the U.S. has reported strikes against only a few dozen targets. What happens next is anyone’s guess. Coalition forces are in control of Syria’s most important oil and gas resources. However, it’ll take billions of dollars and years of sustained foreign investment before eastern Syria can produce commercial volumes again. Washington’s overall Syria policy is a work-in-progress. Its commitment to those forces that control oil and gas assets is certain in the short term, but that could change in the coming months and years. Washington’s overall Syria policy is a work-in-progress. Its commitment to those forces that control oil and gas assets is certain in the short term, but that could change in the coming months and years. In February, the Coalition defended a U.S. base at the old Conoco gas field, killing hundreds of Russian mercenaries and pro-regime fighters. How long will the U.S. stay deployed in these resource-rich areas? Will the Coalition resist more attacks, even after Americans withdraw from the front lines? ISIS may be out of the oil business, but the fight for Syria’s oil and gas wealth isn’t over.